Beatrice Prior has a decision to make. She also has a secret– a secret that could cost her her life. Note to Reader: This review contains spoilers. 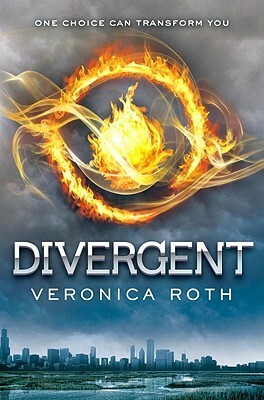 Divergent is Veronica Roth’s first novel, and it also quickly became a #1 New York Times best-seller. Many readers said that it was as good or even better than Suzanne Collins’ dytopian young adult thriller The Hunger Games the first book in her world-wide best-selling trilogy. Of course, when I heard this, I decided that I was going to have to get the book. Sadly, I cannot say the same as other people when it comes to comparing it to The Hunger Games. Yes, the book was good, but it lacked the intensity and the character development that Collins’ book had. Beatrice’s (Tris’) secret isn’t explained the way that I would have liked. Yes, Roth explains what the secret is, but the reason why the secret needs to be kept secret and why it is so dangerous seemed not to have been explained as well as it should have been. Sadly, Roth missed some opportunities in the novel. As I was reading some scenes, I pointed out a bunch of things that I would have done with the characters or the events that would have progressed the story with more flow and the intensity that the book sometimes lacked. Some of the scenes seemed to have ended too quickly. There is one scene in particular that starts on one page and ends on the next page. Roth could have done a lot more with this scene that could have made for a fun scene that could have given the reader some comic relief. Also, it seemed that a small fraction of the events in the novel actually led up to the big climax at the end. The scenes that did lead up to the climax could have been a little bit more prominent in the storyline. However, this is Roth’s first novel, and it is for young adults, so she can have a little leeway. Even with its faults, Divergent proved to be a good first novel with an interesting culture made up of different factions whose customs can be engrossing. I am happy to say that the book was good enough that I purchased the sequel, Insurgent, last night.